RE. the couterbalance; on the MKXI as above, there was not a counterbalance, except, which you may be refering to, to be sure, for example the /|\. A circle L for luminova could be positioned either in place of the b/arrow or below the hands and closer to the date at the 6. That is one possibility, the standing for Superluminova, if that is used for the lume, as the circle T was and the circle P on mil watches. Perhaps, imo the maker's mark, as described, is done small enough and as in the clever manner JLC did, as somewhat described in my previous post, it may be absolutley fine without a balancing. Am not sure yet, though a very good point, imo. The date with the shortened lines as per the first pic on p.1 may balance it very well, itself, what with the underlining of the maker's name in the dynamic way of the JLC at the start and end (their J and E)! Precista, I don?t mind ... perhaps with Speedbird or Speedbird III, below the hands. Precista Watch Co, is stretching it a bit. IMO Speedbird is fine, too, as described. They are some open ideas. I would minimise it and make it thinner lettering and not touching the batons, thus it would be extra discreet, but proudly there, in keeping with the watch and its nature. Re positioning of a name, I feel below the hands, would be too heavy, what with the date alreasy there and the adj. if lines, too. The eye would be drawn there, whereas in classical design principles, and ergonomics, this area should be more open. The lettering need be light and compact, as in the JLC, for best result, imo. I prefer Precista or Precista Watch or even the full Precista Watch Co., but that is my taste. I would go with 'Speedbird' of the other choice, numerals can look somewhat of a series than demonstration of great watchmaking, as the top brands oft do, imho. I have gone around thinking sterile is best for ages but have started to undergo a change of mind during the dicussion of this watch. I am beginning to reformulate my view on this into "Sterile is best = Yao watch" and lovely beasts they are too! There's one in the post for me at this very time. 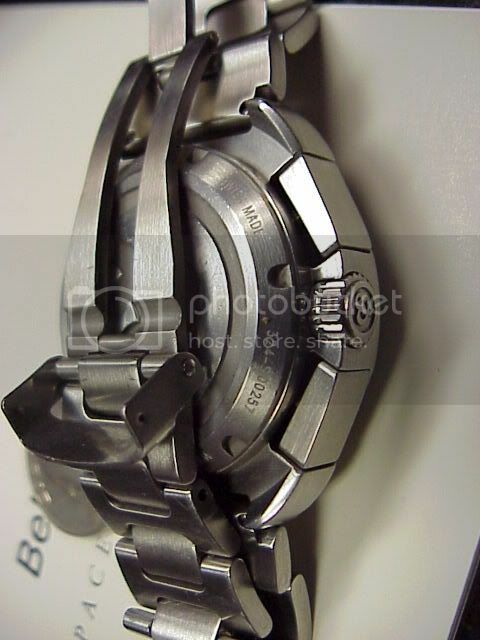 However, this new watch of Eddie's is going to be so nice either way that I refuse to worry. Of course, the print must be small/tiny, pin sharp etc. On way perhaps of having one's cake and eating it too, might be to print glossy black on black. The words F-104 on the big dial of my Glycine are done like there and it's sort as if they were there and not there, that is, oyu can see it if you want but it is easy to ignore. On way perhaps of having one's cake and eating it too, might be to print glossy black on black. As to having England on it, out here I'd quite enjoy that. Us expats can get disgustingly patriotic at times. "Proudly Made in the European Union"
God forbid any flag displays à la :usa2: ? apologies to my cousins in what is still the best country in the world. as for the :pukeleft: EU :pukeright: the flag I do display on left says it all, I think. I was planning for the dial to be completely devoid of names, country of origin, etc. Cyprus + Wherever I'm Sent! SB3 photo has recaptured my imagination after missing out on the SB1 and reminds me, as it should of the wrist watches that the older medal ribboned BOAC pilots wore when I was a 'young' fitter with the airline. Size matters and while I'd prefer some things to be much bigger a wrist watch of this style is not one of them, 39mm diameter being at the very limit for me. If a 'ladies' version of the SB3 or an equivelent was to be produced at 36mm diameter with 20mm lugs I would most probably swallow my pride and go for it preferring the under to the overstated! Sterile dial looks brilliant although 'Precista' would not detract from the beauty of the instrument. Circle P's T's and arrows can look good as a counter balance but are not in my view necessary in this case. Country of origin well why bother, far better I would have thought to have 'Sheffield' placed there as a nod in the direction of where the idea for the watch was conceived. Fixed bars may be truer to the original but spring bars mounted in drilled through lugs are far more practical and in themselves denote in my opinion quality, who of us fails to spot drilled through lugs on the timepeices of fellow travellers etc? The crown? well that seems to be the SB3's crowning glory, dont change it! I dont normally contribute anything to this forum as time (no pun intended) is at a premium and those members who are better quailified say mostly what I would mean to say anyway. But Eddie's SB3 project proposal has rekindled the search abandoned when the last SB1 was sold. I'm pretty sure that Eddie's said earlier in this thread that it won't be LE! Can you supply me with white letraset letters please Eddie?? I would like K, V, X, I, C, M and W please. Seriously though, the picture you showed in the first post in this thread is absolutely perfect, just as it is. Why mess with perfection?? I will ALWAYS regret selling my Speedbird 1, and I'll be first in the queue for one of these. I'll even put up with a sapphire crystal, but I'd prefer acrylic. It is interesting to think of some alernatives and share them. One never knows when they may come in, perhaps usefully. As I worte earlier, I like the orig. design v. much; It could well be a flyer! I look forward to more news of it as well of as its finalisation. If it comes plain (no brand or origin designation), I would not wish to alter it. Should the lines for the minutes as well as the batons not extend to pretty much the edge of the dial, as in the JLC, for example, I may consider altering that feature. Looking forward to the continuing good news about the project. If the SB3 gets equipped with acrylic crystal how about marking or stamping the crystal with the tiniest Precista-like logo, say a quarter of a millimeter across? Only from certain angels will it be visible. The Broadarrow-logo as per the 53 would be very classy, imho. The Broadarrow-logo as per the 53 would be very classy, imho. Okay, any suggestions then? Maybe the well designed P in Precista? I believe it would make a sweet engraving on the crystal and a lovely detail, too. Hello folks, I thought I would add my 2 halalas worth to this one as it really appeals to my idea of what a watch should be. I love the original image,but, I would make the seconds hand the same as my IWC, i.e the same colour as the other two but the tip lumed. Not a good picture, but you can see what I mean. Imo, Lume-tipping is a v. good idea. Adds to the functionnability and utility of the piece. It also distinguishes it from some others, well. Subtle and v. effective. I would make the seconds hand the same as my IWC, i.e the same colour as the other two but the tip lumed. Is that a yea or a nay then Martin? As it happens I agree, no lumed tip. But ... this IWC chrono (which I am trying to flip for a friend) has lumed subdial-hands but no lumed seconds which I find odd ... am I missing something? Eddie, any final comments on this one? I'm still waiting for a couple of answers to questions about minor detail. Have you any idea when this one might be due Eddie? I daren't start any more projects at the moment, there's that much already in the pipeline I'd be wiped out financially if they all came at once! (Have to pay up-front before I've sold anything to get cash back in). I would like to use the 2892 because I want it chronometer grade but the main reason is that I would like to keep it to a maximum 11mm thick with the anti-magnetic cage and dust cover. Probably the only criticism owners of Bill Yao's Quad 10 have is that it's too thick. I thnk that is a good move. The reason the SMP is so comfortable is because of it's slimness. I wont be filed, stamped, indexed, briefed, debriefed, I am not a number, I am a free man, my life is my own!!! Couldn't agree more. It's the 'pork-pie' element that stops me buying several watches. Mainly, I don't like the look of them on my wrist, but perhaps more importantly, they inevitably get bashed due to their extra height. You can also wear an SMP under a shirt cuff without too much difficulty, making it a flexible 'dress' as well as a 'dress-down-Friday' watch. I've been on about this before, but I'd like to add that slimness is not just important to fit under the cuff of a dress shirt. It's also important for a diver when donning and doffing kit. The '14 got ripped off my wrist (springbar failed) when it caught on a shoulder strap while donning an admittedly very heavy rebreather rig :shock: . If I'd been wearing an SMP, I doubt that would have happened. I have long argued that flushness is a comparative advatage in a watch when working in a cramped environment (like an airplane cockpit), or with lots of gear straps around ... personally I think that the smallness of many WWII era watches took that factor into account. In terms of pure ergonomic design, I think this one takes a lot of beating. This one's not bad either. On the subject of flatness, I recently learned that Sinn manage to control the height of the 656 (under 11 millimeteres) by making the caseback from antimagnetic steel ... so the caseback itself doubles as the antimagnetic cover of the soft-iron cage. That must shave 1 or 2 millimeters off the overall height. Fricker told me that the anti-magnetic dust cover adds 1.2mm to the thickness of the watch. The 2892 is 3.6mm thick versus 4.6mm for the 2824 so by using the 2892 instead of the 2824, we can lose almost all the extra needed for the anti-magnetic cover. I assume that is the reason why IWC use the 2892 base in the Mark XV/XVI (separate antimagnetic cover) as well instead of the 2824. Antimagetic steel is magnetically transparent. It doesn't become magnetized, but offers no magnetic protection to anything it envelopes. At least that is my understanding. Soft-iron is easily magnetized, which is what allows it to protect what it envelopes. So, do they have something like soft-iron, but only hard? Or, perhaps standard steel bonded to something like mu metal? The 656 caseback is not a composite material ... Mr. Schmidt said that they managed to make the shielding material the same look and hardness as the rest of the case (316L material). Apparently a major hurdle in the production of antimagnetic watches is the dial, by the way (the movement ring is not a great challenge, by comparison). The dial-makers need massive help from Sinn to put the dial print onto the antimagnetic dials which obviously have different properties from brass (or whatever material is used) dials.. I think a more traditional Mk XI or XII style dial with extended hour markers would look nicer. If it is to have a date window :) I think a 3 o'clock spot is better. a nice SEL bracelet ala IWC would be great. 38mm size would be perfect. anything larger would not be as good IMHO.